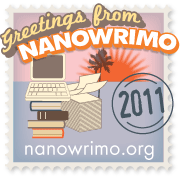 I’ve been thinking a lot about NaNoWriMo (NaNo) over the past few days (weeks). Ever since last NaNo, I’d anticipating competing this year. After all, I finished and won last year. It was such a wonderful, though stressful, experience. This month I started thinking about what I’d write for this year’s NaNo and was at a loss. It’s not that I don’t have story ideas… trust me, I’ve got plenty… too many. But most of my story ideas aren’t meant to be seen by the world for a while… years into the future. Why? Because I just don’t have the time or motivation to edit everything at once. For instance, I started Trinity’s Awakening (book one in Trinity’s Destiny), so that’s a no go for NaNo. Remember, for NaNo you’re supposed to start a story from scratch. That means, I’d need to start book two (Trinity’s Descent) or book three (Trinity’s Redemption) to qualify. I was in a similar situation last year with the Striped Ones series. I’d already started book two (Chasing Shadows), so the next option was book three (Shadows Within). I settled on book three. A couple of months later, I finished writing book two. Here’s the thing… I never got around to editing book two or three of the Striped Ones series. So am I going to write book two from Trinity’s Destiny then finish book one and have a total of four unedited books? Eventually, I’ve got to finish something. I can’t just keep writing and writing and never going back to polish or edit. Not if I want to get those works into the world. Then I have other books I’ve started and yet to finish. Those are just the works off the top of my head. I’m sure if I open my folders, I’ll find more unfinished works. The above is enough writing to keep me busy for a year, and that’s before I start editing the two Striped Ones books. *sigh* I want to participate in NaNo, but I also want to finish what I’ve started. The idea of starting another story with so much unfinished work rubs me all sorts of wrong, to the point it stresses me out. So here’s the deal. If I can’t scrounge up the motivation to do some SERIOUS editing on Chasing Shadows, I’m not participating in NaNo this year. I’m not fond of polishing or editing, and I just can’t stand the idea having one more book on my shelf waiting for my attention. So tell me, peeps: What are your motivations and/or concerns about NaNo this year? How are you addressing them? I’m still deciding whether I’ll do it this year or not. I probably will be starting something new, but I think it’ll be the next Flash Gold story rather than a full length novel, and that won’t reach 50k. Also, I’ll be traveling and unable to get online much in November, so I’m not sure I want to dicker around with updating word counts there and such. It’ll be tough just to get blog posts up and check in on Twitter (wouldn’t want to miss that lol).